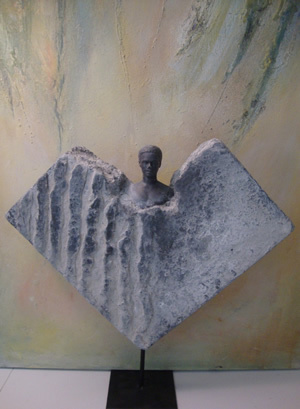 Stone-art is a unique structure powder that has been specially developed for Powertex. in a still wet Powertex base : great effects on canvas. You can use Stone Art in different ways. Pour equal measures of Powertex and Stone Art into a container and mix together. Carefully add more powder until you get a firm modeling paste . The paste which you prepare should be used up within 1,5 hours if it’s exposed to the air. It can be preserved if placed in an air tight container. Apply Powertex onto your statue with a medium size brush, sprinkle Stone Art powder over the Powertex and rub off excess. Again apply Powertex on the areas where you want to apply more Stone Art. A shiny effect is created by rubbing with the palm of your hand. The powder disappears where the shining effect appears. Repeat the polishing continuously until the desired effect has been reached. The more you polish the darker the effect will be. By using Powertex Lead you create a beautiful bluestone imitation. If you are planning to place your sculptures outside, please note that the powder is not weather proof and will rinse of when wet. So we suggest you to use Easy Varnish to complete the sculpture. By rubbing a little gold paint on to a Powertex Bronze statue and then by brushing it with green you create a wonderful bronze imitation. A nice variation of nice pastel colors can be created by using powder pigments. Work with surgical gloves. this is not required but is very practical.